A system for disinfecting water through the simultaneous use of solar energy converted into electrical energy and ultraviolet radiation generated by UV lamps. These are villages or periurban neighbourhoods that do not have drinking water, a collective treatment facility or sufficient resources to create one. It can have various forms that are similar except for a few variations and of which the best known, as it is the most marketed, is the so-called NEDAP method. This is a process developed by the Dutch company NEDAP which is specialised in electronics and in water purification via ultraviolet light. This company has perfected a 75-Kg small-size and mobile device, the "Naiade". The latter filters the water thanks to two washable filter-bags, and disinfection accomplished using an ultraviolet lamp that runs off of a solar panel that generates 75 watts of electricity. After filling the reservoir, the water passes through 3 filters that successively retain gravel, suspended matter and particles. Triggering a switch lights the UV lamp which heats up in two minutes and emits UV radiation which disinfects the water at a rate of 4 to 5 litres of water per minute. It is easy to install and operates on its own. It does not need to be connected to a source of electric energy nor does it have to be connected to a source of water as it can be filled manually. The facility kills all of the pathogenic agents via the ultraviolet radiation and makes the water safe to drink without the use of chemicals. It can purify up to 2,500 litres of water in ten hours. - Low maintenance cost once the equipment is acquired. - Good daily production capacity (up to 2,500 litres of drinking water). - Equipment that needs to be imported. - High initial purchase cost for the purifier. - The water is not protected from becoming contaminated again, if it is not used quickly enough. The latter came to light in 2004 in 3 Cambodian villages but in 2011 was expanded to about forty others (40,000 people) with the goal that was set by the organisation of the same name that had launched it of reaching 200 villages by 2015, and then to develop it in Madagascar and in other countries. Its co-founder is from Cambodia and is about thirty years old. Lo Chay, who comes from a modest family from a village in the northwest and who, after being able to study thanks to the "Children of the Mekong" association, received a degree from the Ecole Nationale des Eaux and Forêts and wanted to put his knowledge to work in developing his country. The purpose of this concept is not only to provide drinking water to people or communities that do not have any, but also to create a small economic activity locally by selling the water produced at a low cost (1 centime/l) but which is enough to remunerate one or two people (€45/month, to be compared with the average monthly wages for a family of €10/month) in charge of purifying the water and selling it. The technique is practically the same as the previous one. The device, called Fontaine, does not take up much space as it can be placed in a cupboard, is comprised of 4 filters and an electric ultraviolet lamp powered by a solar panel. Before the water is introduced, it passes through 2 larges tanks each containing 3 m3 located in an adjoining room and where a preliminary step of flocculation and decantation is carried out, which removes the suspended matter from the water. The water then flows successively through 4 filters ranging from the largest (60 microns) to the finest (1 micron) before it is finally exposed to the radiation from a UV lamp which kills or inhibits the bacteria. The investment cost is €15,000 per village for 2000l/day. By making the water safe to drink at a low cost and by selling it in small quantities and at a reasonable price, the concept’s promoters strived not only to provide a minimum of drinking water to villages that did not have any but also to initiate an economic activity in these villages thanks to the jobs that are as such created. The water produced is sold, which without a doubt does not allow everyone to take advantage of it, especially the poorest people. c) Other larger-scale devices that treat water with ultraviolet radiation. The method of purifying water through the use of ultraviolet radiation no longer concerns just isolated areas or those with a low number of homes, but now entire towns where it is replacing, or is reducing the intensity, of conventional water treatment via chlorination and prior flocculation with aluminium sulphate which some feel can have potential long-term effects on health and who would like to have this replaced with a more ecological process with a UV base. For example, this is already the case with several facilities in the cities of New York and Montreal. Some research organisations or young companies, such as SwissINSO near Lausanne are moreover currently testing new prototypes of ecological facilities that perform even better by combining, for example, for high-volume treatments, a treatment via UV with an improved reverse osmosis technology. It is therefore likely that this technology is going to advance and that it could result in new and interesting devices for populations and villages with limited resources. Wat tamin is a Cambodian village of 7,00 inhabitants which can be reached only via a dirt path and where drinking water could be obtained only from Battambang, the closest town but 20 km away. 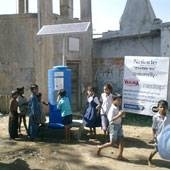 The installation of a UV fountain with the assistance of a local NGO "Buddhism for development" made it possible, after an awareness campaign for the population on the problems of hygiene and health, to produce over 1000 20-l bottles of water at a price of about 10 euro centimes per unit, which is 25% less than beforehand, and the profits made allow for the remuneration of two operators, Mr Yan Chomnan in charge of production and distribution and Mme Ouk Hak Vi, in charge of financial management and assistance with production, who both come from the community and for the financing of small investments. The bottles are either sold at about twenty stalls or stands located in the 7 villages of the commune, or are delivered using a motorcycle pulling a trailer loaded with 20 bottles. Once used and returned, they are carefully washed before they are filled again.